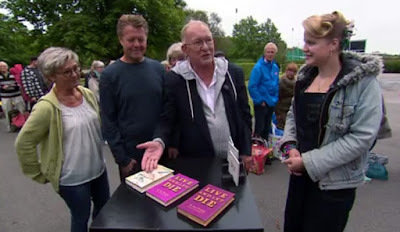 On this weeks Swedish version of Antiques Roadshow I was amazed that the section "Good, Better, Best" was covering something as rare in Sweden as Ian Fleming first editions. I do not know if this section is present on the British versions of the show but what it comes down to is that the public will see three objects and try to figure out which of the three is worth the most money. According to the owner of the books and book expert Torgny Schunnesson one of them was worth 20 000 SEK (£1 600) the second one was worth 100 000 SEK (£8 000) and the third was worth 300 000 SEK (£24 000). And then the public got to guess and most of them actually guest right without touching the books. Now I was very curious to know more about these books since the evaluation was far higher the usual. 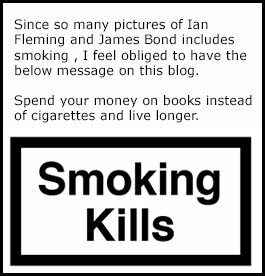 But I got disappointed when the owner and said expert on the matter said that a first edition of ON HER MAJESTY'S SECRET SERVICE is worth 20 000 SEK (£1 600) since I bought my second first edition earlier this week in excellent condition and only paid 4 100 SEK (£330) for it. And that is a bit more then most of you would pay. You can currently find it on Ebay for 4 400 SEK £350 in fine condition. The difference between the to LIVE AND LET DIE editions is that one of them is a true first edition and the second one is a second state version. the actual difference is very small. On the front flap of the dust jacket of the second state is says "Jacket design by the author and executed by Kenneth Lewis". According to the expert on Swedish television the version with the text is worth 100 000 SEK (£8 000) and the one without the above text is worth 300 000 SEK (£24 000). Once again a quick search on Ebay tells you that this is not the case. The cheaper second state can be bought for 71 000 SEK (£5 666) and a true first edition can be bought for 135 000 SEK (£10 840). All in all the Swedish Antiques roadshow was off with an amazing 209 600 SEK (£16 800). I would almost have paid to be there that day of recoding just to smack the expert on his fingers. 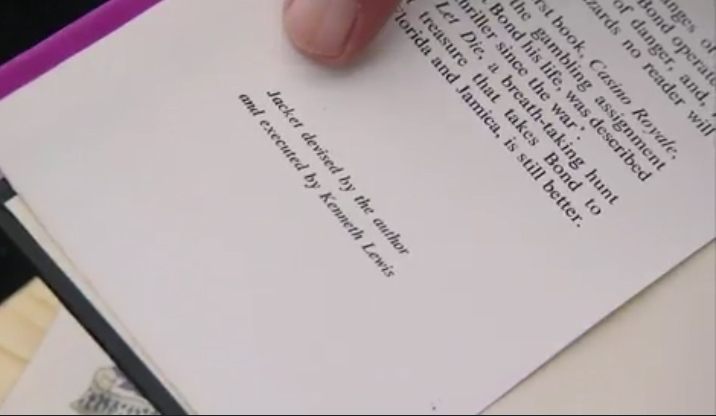 But that would never have made it through the cutting room. If you wish to see the program and this part of the show you can follow the link and then skip forward to 31:30 and then to37:00 to see this for your self. I believe I will have to call my insurance company to raise my insurance after this ;0). I just dont understand this dust-wrapper?